watching the world uncaring we're here. when you look out from wherever your vantage what do you see? I think it is always interesting to see what is important. I am in India right now and the perspective I have on that issue changes being here. For the hungry person- it is food. For the lonely person--it is company. For the angry person--it is peace. For the hopeful person--it is satisfaction. For the homeless person--it is shelter. For the wealthy person--it is security. How then in the world, broken and hurting dare we spend one minute on things that do not build up the Kingdom where these needs can be met? How dare we pretend we have anything important to do ourselves or are entitled to a cushy life... until we are all free? Other peoples importance coming first! Gravity is a fact of life and we live with it. We don't on purpose try to defy gravity? We don't step off a curb and not expect our foot to meet the ground without us doing anything else but leaning out off the curb. We are sometimes caught by gravity if we don't see that drop off. In one of our churches there were stairs that could be pushed in or pulled out if we wanted to step down from the middle of the chancel. There were parts of the knee high wall that were pulled back and we'd had the steps out for some time. As I one Sunday moved toward the Communion Table which was at the bottom of these four steps I was looking out at the people--not really looking down at the stairs. Which, on this day, had been pushed in even with the wall opened. One of the church members saw what was happening and got my attention and I looked down in time. I was still moving forward but I made my step off applied appropriately. If I hadn't known I would have expected a step at 5" down rather than a foot and a half. I made the step down without incident and only a few noticed that I'd landed hard. What else in the world do we try to defy the laws of nature? What laws of the world do we ignore and pretend that we have powers over them? We spend millions of dollars as a society on plastic surgery to make us 'stay young'. We spend 8 Billion.in the US on cosmetics.are we not trying to defy laws of nature? Mark Driscoll said that he realized he "was addicted to the false trinity of our day, the gods known as Noise, Hurry and Crowds." Reading that made me stop for a moment. I mean here I am early in the morning reading news reports from around the world, reading email, and with the news on the tv, John and I are talking. Why not start the day by stopping. Being awake and alert and being also aware of the day but silent? It can happen if I so chose. What about you? How do you start out your day? How do you find a pause in the middle? Do you find a way to be quiet? Do you find a way to be still? When there are others in the house it sometimes takes their cooperation. But friends it seems to me that I am going to do that. See the tv's off, John has a meeting to attend, I can read my email at work, and the world will go on without me reading each detail, oh and I'm going to close this note to you. It is purely full moon over the house tonight. The yard has been lighted by the light. We had warm weather this afternoon but a wind came through and cleared away the clouds. So now, the moonlight is clearly present. What does it take for you to see the moon? Do you need to blow away the clouds? Do you need to look up at night? Do you need somehow to find a way that is a New way for every way we are moving as people on this earth? My moon is yours. We share the moon and the sun. And we can control neither. Moon moon shining up above. 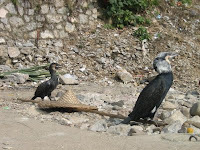 To catch fish with a cormorant you have to train the birds. Chinese fishermen have done this for a long time. These birds really love fish. In order for them not to eat all the fish they catch you tie a small grass circle around their necks, not too tight, and you let them dive overboard. This way they catch the fish but cannot fully swallow them. Many use a cord to pull the bird back in the boat when they have a fish. Then you squeeze the neck gently and the fish pops out and you send the bird again out to fish. When you have what you need you untie the string and let the birds get their own food until the y are full. Some of these birds live 20 years working for one fisherman. Now what in the world will this information do for you today? Well I think sometimes we feel like we are these birds. We go out after something important and we may get a hint of it but we can't swallow it. We are never satisfied. Perhaps in our faith life this could be seen that we go and find the truth and the peace and the hope and the grace of God ... but we don't swallow it. We spit it out before it can nourish us. Then we go out again and again. We find the Word in the worship but we walk out of the sanctuary and begin to bicker with someone just outside the door. We promise to be generous but we hoard all we can. We feel God's love but we depend more on what WE can do and how WE can control all those things around us. We want our fill... but we refuse to swallow. Or perhaps, and this is probably stretching the point, we are ok with just a taste of the Good News and are fearful that if we truly taste it, then everything will change. what? untie anything that blocks your ability to fully take in the love of God that Jesus teaches us. Untie anything that keeps you from living with the nourishment of the Holy Spirit. Loose the bounds of the world and trust...that where you are taken by God's love will be a place of incredible grace and joy. It's the second of January. Time flies, and life continues and grace upon grace appears in this world. Let this year be one that brings you amazing peace, deep abiding peace.